Money with images of Disney characters is available for purchase inside City Hall (Magic Kingdom) and Guest Relations (Epcot, Animal Kingdom, and Disney Studios). These come in $1, $5, and $10 denominations. 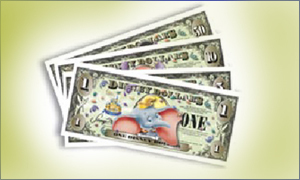 Disney Dollars are accepted as cash throughout the Walt Disney World Resort.